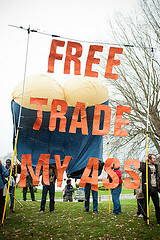 TPP Demonstration Dec 1, Peace Arch Park. Photo by Caelie Frampton. Interview with Stuart Trew of the Council of Canadians about the growing opposition to the Trans-Pacific Partnership Trade Agreement. Interview with award winning writer, Dennis Gruending about the relationship between the Conservative Government’s policy of support for mining corporations and the Catholic Bishops’ suspension of a postcard campaign by the Development and Peace Aid Agency. Claudio Eckdahl discusses role of Canadian Mining Corporations in Latin America. The Royal Bank has reported a record annual profit for its latest year, including $1.9 billion in the fourth quarter, according to the Canadian Press. It appears that the Harper Conservatives are not winning many friends at the international level. The Rabble.ca website reports on a comparison of the reception received by five consecutive speakers at the UN General Assembly on the Palestine resolution last week.The report found that Canada’s Minister of Foreign Affairs, Conservative MP John Baird, was received in silence.